Color red rocket sirens heard in Gaza Belt region, residents report hearing explosions. Missile apparently struck open ground. Color red rocket warning sirens were sounded in the Gaza Belt region adjacent to Gaza on Sunday night, with a missile reportedly striking open territory close to Mefalsim, located near Sderot opposite from northern Gaza. No one was wounded in the rocket strike. Gaza Belt residents reported hearing clear explosions after the siren. 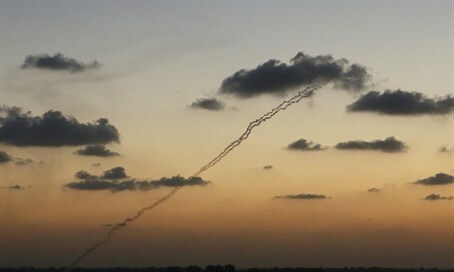 Gaza terrorists have on various occasions fired rockets and conducted numerous breaches of the ceasefire that ended 2014 Operation Protective Edge. The latest rocket attacks comes as Israel is being battered by a wave of terror attacks, which have taken the form of stabbings, car rammings and shootings, and claimed the lives of 29 victims since last September.